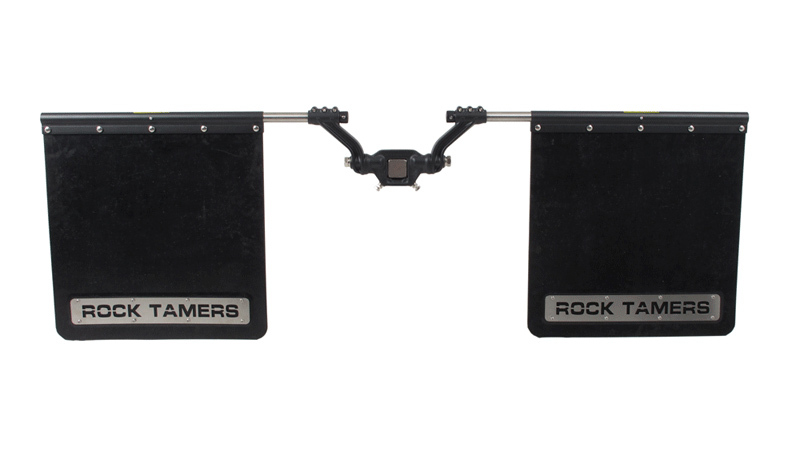 00108 67"-93" 67 inch - 93 inch Black Matte Rock Tamers Mud Flaps - Use this NK Rock Tamers Mud Flap system to protect your towables from mud, rocks and gravel. This premiere adjustable and removable mud flap system gives your towables the ultimate shield from dings and scratches without taking away from your trucks everyday stylish appearance. NK Rock Tamers uses only top quality materials and components to make certain your 5th wheel, boat or trailer gets the maximum protection and are easy to install, no drilling required. They are adjustable from 66.75 inch to 93.75 inch wide which allows them to fit your full or dually-sized truck, they truly are a one size fits most system that simply secures to most 2 inch ball mount and receiver hitches. These mud flaps are molded with a layer of tear-resistant fabric and are a heavy-duty 24 inch x 24 inch rubber that is 3/8 inch thick. Mats can be trimmed to any length using the pre-molded cut lines and the support rods are forged from steel tubes with a protective coating of polyethylene. Covered by a 1 Year Warranty. Black Matte finish in color. Dimensions: Adjustable from 67 inch - 93 inch wide x 3/8 inch thick.